Bion Barnett, Jacksonville. Bonifacio, 1921, watercolor, 27 by 36 inches. After the war Barnett remained in France and in 1920 purchased a small place on the Island of Corsica where he spent a part of each year painting. In 1937 Barnett became a full member of the Salon d’Automune, and the Societe National des Beaux Arts. He received the silver medal at the Paris Exposition and was elected a Chevallier de la Legion d’Honneur. His paintings were exhibited at the Salon in Paris, for six years at the Royal Academy in London, and the Salmagundi Club, Lotus Club and Allied Artists in New York City. Barnett married Yvonne Charvot in 1924. Yvonne was the daughter of French artist Eugene Louis Charvot. They lived in France until 1940 when German occupation forced them to returned home. In April 1949 Barnett had an exhibition of his work at the Jacksonville Art Center on Riverside Drive. Education: Art Students League, New York City; Academie Julian; Academie Colarossi; Academie de la Grande Chaumiere, Paris; Woodstock, New York; Provincetown, Massachusetts; Ogunquit, Maine. With John Carlson, Birge Harrison, Hawthorne and Davel. 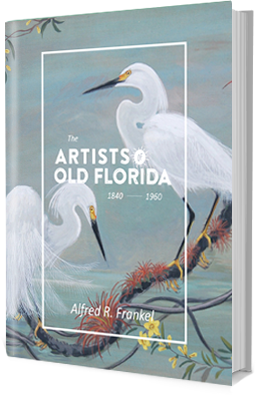 Membership: Fine Art Society of Jacksonville; Civic Art Association, Jacksonville, president, 1940-1943; Jacksonville Arts Club; Palm Beach Art League, 1944, 45; Society National De Beaux Arts; Grand Central Galleries Association; Salmagundi Club; Society of The Four Arts; Artist member of Hobo’s Club. Exhibits: Traveling Exhibit, American Federation of Art, 1917; Salon d’Automne, Paris, One Man Show; Society National des Beaux Arts, Royal Academy, Paris; Silver Medal, Paris Exposition, Chevalier de la Legion d’Honneur, 1937; Palm Beach Art League, 1941, Henry Ellsworth Bemis memorial award for Best Florida Subject, Dunes at Pablo Beach; Florida Federation of Art, Circuited Exhibition,1941-42, Clearwater Art Museum, Dunes at Pablo Beach; Florida Federation of Art, December 1941, Tampa, Dunes at Pablo Beach; Society of The Four Arts, 4th Annual Members Exhibit, Palm Beach, March 1942, Valley of the Gravona; Florida Federation of Art, Traveling Exhibit, April 1942; Society of The Four Arts, 5th Annual Members Exhibition, January, 1943, oil, Cap Pertusato, Corsica; Society of The Four Arts, 6th Annual Members Exhibition, Palm Beach, January 1944, oil, Beeches and Birches, Maine, The Red Blueberry Bush; Palm Beach Art League, Norton Gallery, March, 1944; Society of The Four Arts, 7th Annual, January 1945, honorable mention, Eucalyptus; Florida Federation of Art, Annual Circuit, 1944; Jacksonville Woman’s Club, February-March 1945, Miss Elizabeth; American Association of University Women, YWCA, Jacksonville, March 1945, Sand Dunes, Jacksonville Beach; St. Augustine Arts Club, January 1946, three oils including, Dunes at Pablo Beach; St. Augustine Arts Club, February 1947, oils, Coconut Palm at Sewell’s Point, Mountain Ash near Corte, Corsica; Arts Exhibition Club of Jacksonville, YWCA, May 13-15 1946; Jacksonville Arts Club, Annual, May 1947, 3rd prize, landscape oil, End of the Day-Ajaccio, 1st prize, pastel, Ajaccio Bay, 2nd prize, pastel, Clouds-Corsica; Jacksonville Arts Club, Fall Exhibition, November 1947, at American School of Art, East Adams Street, Pastels, Dunes North of Atlantic Beach, Corsican Valley, Still Life, oils, Coconut Palm at Sewall’s Point, Cedars and Crepe Myrtle, Mountain Ash Near Corte’, Corsica, Still Life; Society of The Four Arts, 10th Annual Members Exhibit, December 1947-January 1948; Arts Club of Jacksonville, Spring Exhibition, May-June 1948, at Children’s Museum, Riverside Avenue, prize, pastel landscape, Coast of Madeira, honorable mention, Cedars, Crepe Myrtle; Daytona Beach Art League, January 1952; St. Augustine Art Association, April 1954, judge; Jacksonville Art Center, Jacksonville Arts Club, two man Exhibit with Howard Ahrens, fifty paintings including landscapes, portraits, watercolors, pastels and ballet sketches; Jacksonville Art Museum, Annual, 1956, 1st prize, landscape, Valley of St. Antoine Near Ajaccio; St. Augustine Art Association, January 1960, judge. Directory: Listed in the Jacksonville City Directory as an artist, 1916-1917, with studio at 714 Riverside.